Scythe contains one of the most purely satisfying actions I’ve ever experienced in a board game. Picture this: a beautiful individual player board that shows every action available. On this board, slotted into indentations from that rad double-layer cardboard thing that should be mandatory for all player boards in all games going forward, are cubes. Take the “upgrade” action and you can remove one of the cubes from the top half of the board, revealing an upgraded version of that action! Now you can, for instance, produce from three different hexes instead of two! And then–this is the exciting part–you place the cube in a slot on the bottom half of the board, making one of those actions cheaper. I can exactly picture the face my wife is going to give me when she reads the above paragraph–a face all who know Amber can also picture. Lips pursed, eyebrows raised, a stare of disapproval only slightly betrayed by a bemused curl at the sides of her mouth. It’s super cute, but don’t tell her I said that. Anyways, no matter. I’m a nerd, and I fully embrace the fact that moving a small wooden cube can get me so excited. Where was I? Scythe. 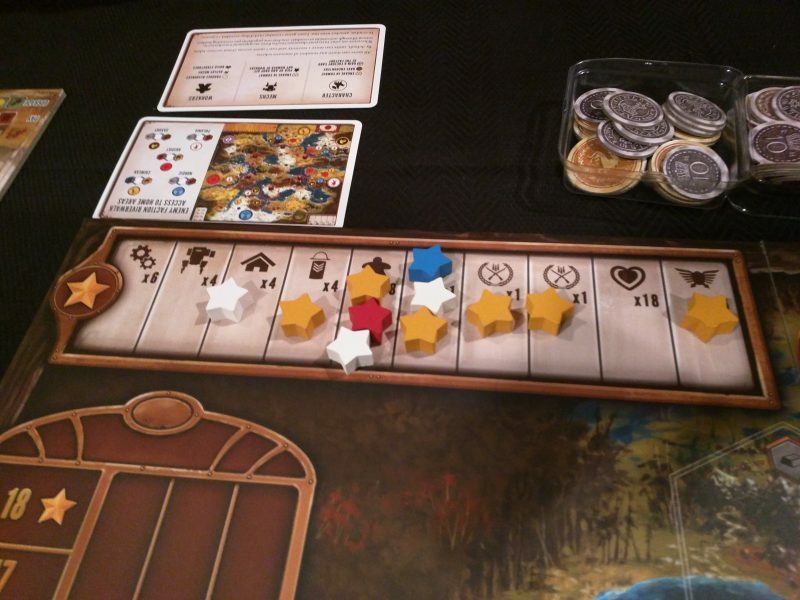 Probably the most hyped board game in recent memory–maybe ever. I just dug through my emails to find the one I sent to my board game group immediately after it was announced. It read: “I feel like I need to own this game just to look at the box art all day long.” No doubt that Jakub Rozalski’s agrarian-Bolshevik meets steampunk-mech art is spectacular, and I still feel like the box art is perhaps the best ever. Every time it hits the table, the aesthetics of the entire room increase. But does the actual game match these high standards? I don’t know if it could. But I don’t think it even comes close. Rozalski’s art is mysterious and epic, like a fully realized fantasy world vis a vis “Wanderer Above The Mist”. 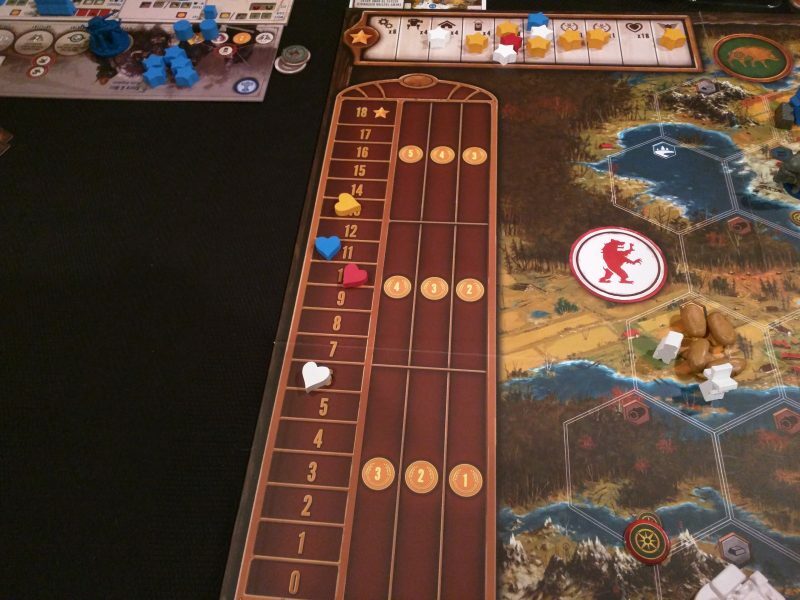 Scythe is a mid-weight economic euro game that plays like a long optimization puzzle. 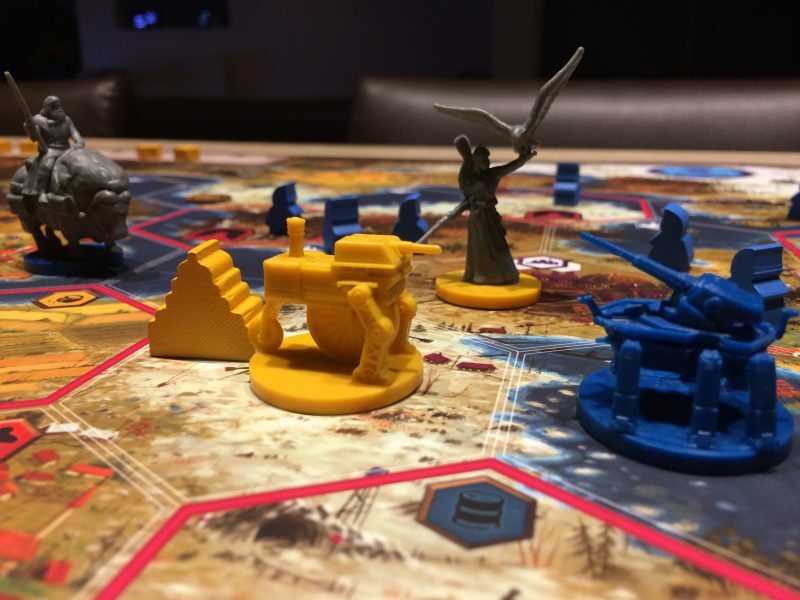 There’s a disconnect here that makes Scythe very difficult to judge. Honestly, strange as it sounds, it might be a better game without this art. Ok, enough about the art. We’re serious gamers here who like serious games. Let’s put our stoic hats on and get into the nitty gritty. Scythe is a very broad game. By that I mean that it seems like the kind of game where, whenever the designer ran into problems, he just added in another mechanism to patch it up. That, or he made a list of all of his favorite game mechanisms and decided to make a game with all of them. I’m not saying that’s how it was actually made–it just seems like that. Players each take a faction mat, which gives them a special power, and a player mat, which is also unique (they have all of the same actions, just in different orders and with different costs). The faction mat is where the mechs sit until they’re deployed, but the player mat is where the real action happens. It is split into four segments. Each segment has a top row action and a bottom row action. On your turn you’ll place a pawn in one of those segments and take either one or both of the actions in it. Because the top row actions are generally productive without much of a cost, you’re nearly always going to do that action. The bottom row actions all have varying costs in resources, so they’re used less frequently. A key part of Scythe is planning out your moves far enough ahead of time so that you can frequently take both the top and bottom actions. This gives a puzzle element to the game, and I find myself frequently contemplating the next series of moves I want to make to best economize my actions. Since there’s so much to think about between turns, and because each turn is remarkably short (it only takes 5-10 seconds to play out a single turn), the game has relatively little downtime, which is a huge benefit for such a strategic game. Honestly, I think I would have liked turns that feel a bit more meaty, even if it meant more downtime between turns, but I know I’m definitely in the minority with that opinion. So what are you even trying to do in Scythe? Well, a bit of everything. Points are granted at the end of the game for the number of hexes you occupy, the number of resources you have, and the number of objective stars you have placed. These stars are also the timer on the game–once someone has placed their sixth star, the game ends immediately. Stars are given out for everything–winning combat, maximizing your military strength, placing all of your mechs, upgrading all of your cubes, placing all of your buildings, etc etc. Basically any time you do a given mechanism as much as it will let you do, you get a star. A shining star, no matter who you are. Because it’s the timer and the most lucrative means of getting points, focusing on accomplishing these star objectives will occupy a lot of your attention during the game. In some sense this streamlines the game, as it helps you focus on a set number of objectives. In another sense it gives a sort of sandbox quality to the game. There are 10 possible objectives, so your focus can shift dramatically from game to game. But–and I hate to sound like a broken record–the game is so tight and so focused on economizing your actions that it can’t really provide that sandbox experience it hints at. The best part of the scoring system is that there’s another resource–popularity–that determines the multiplier for your points. If you treat the locals well and are generally a nice fellow as you roam the countryside, you’ll accrue popularity. If you steal their cattle and scare their children, they’re not going to like you so much. How do you interact with these people? With yet another mechanism: exploration! As you send your leader figure across the land, you’ll land on hexes with exploration tokens on them, which let you draw a card from the aptly-named exploration deck. This card will show an image of some kind of leader/peon situation, with three different choices. Each choice has some sort of cost and benefit to it, and they frequently deal with popularity as one of those costs or benefits. As another testament to how good the art is, the cards only present the situation to you visually–no flavor text is included. It’s another nifty part of the game, but I kind of wish that exploration and interacting with the local populace had a bigger role to play in the game. It comes across as yet another neat mechanism rather than something truly immersive into the game world. Any immersion you may experience, however, will likely be jettisoned by the extremely rapid end of the game. As I previously mentioned, once someone places their sixth star the game immediately ends. I cannot overstate how suddenly this can happen. Acquiring your first couple stars will take roughly over half of the game. Once someone gets to three stars, if they’re well positioned, they can quickly grab the final three in only a few moves. Even after a few games it still surprises me how suddenly the end of the game can sneak up on me. It’s another mental calculation that needs to be made, which is great, but it, again, doesn’t seem to jive with the thematic feeling the game is trying to promote. Going down my mental checklist……oh, combat! Yes, there’s combat in this game, with your beautifully imaginative mech minis, although it’s far less interesting and far less frequent than you might think. Combat power is another resource you will gain throughout the game, and when you enter in combat with another player, each side takes a dial and secretly sets it to a number from 0 through 7. Each player can also add combat cards, which range from 2- 5 combat power. Whoever has the highest total wins. It’s neat, tidy, and somewhat dull. It’s very similar to the combat in Kemet, but strictly less interesting, because Kemet has partially hidden information and more variety with the combat card abilities. But, as I said before, it doesn’t happen a lot in the game. There are up to two stars available for combat victories for each player, but, at least in my games, people rarely get both. I think this is a combination of the fact that combat just isn’t very fun, and that there are very severe costs to it. Spending your combat strength and cards will leave you in a weakened state which others can take advantage of. Plus, if you expel any workers through a combat victory it drops your popularity. Although I will grant that you can’t fight with a leggy tractor in Kemet. Thus the game takes on a kind of cold war quality, where everyone is posturing, but no one wants to commit to actually fighting someone else. There’s the potential here for this area of the game to be tense and full of intrigue, but so far I haven’t felt it. In post-game discussions with my friends, we’ve talked about the idea that perhaps we’re not playing as well as we should be because we’re so averse to combat and trying to slow down the leader. I think this is a distinct possibility, so I’m open to the idea that in future games the cold war feeling might be more intense. I’m of two minds about Scythe. I have fun every time I play it, for sure. But I also spend a lot of the game thinking about how great the game could have been. It could be more epic, with more exploration, more interesting combat, more of a sandbox feel. That’s what the game looks like it should be! It’s not fair to the game to judge it for what it’s not. But I wouldn’t be honestly reviewing it if I didn’t communicate my feelings while playing the game. 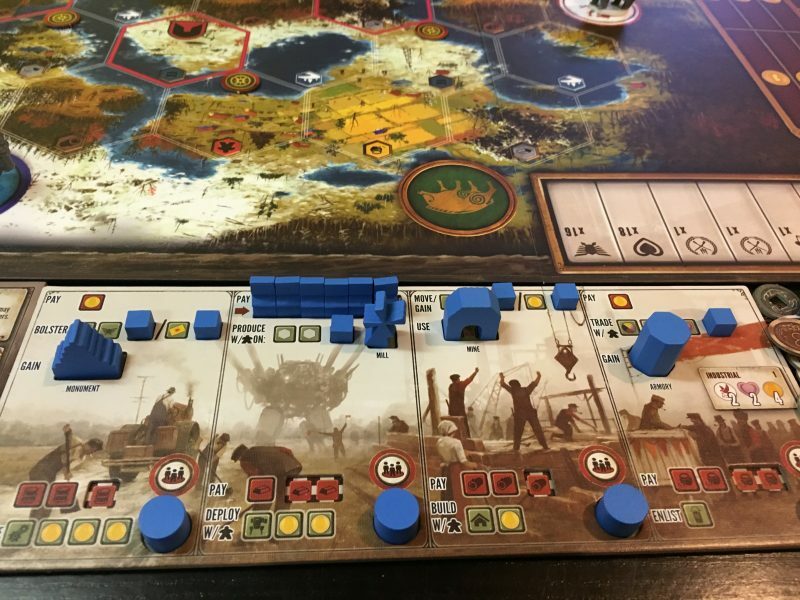 Know this–Scythe is a very fun economic efficiency game with spectacular art, flawless production design (Stonemaier routinely sets THE standard for production design with board games), a quick pace, and a fascinating thematic world. But it’s also a game of contradictions: It’s a snappy game that looks epic. It’s a tightly strategic game with a mish-mash of mechanisms and parts. It’s a visually evocative game with mechanical gears exposed. I think a large part of your enjoyment with Scythe will be dependent on how well you temper your expectations and not let the cognitive dissonance get to you. 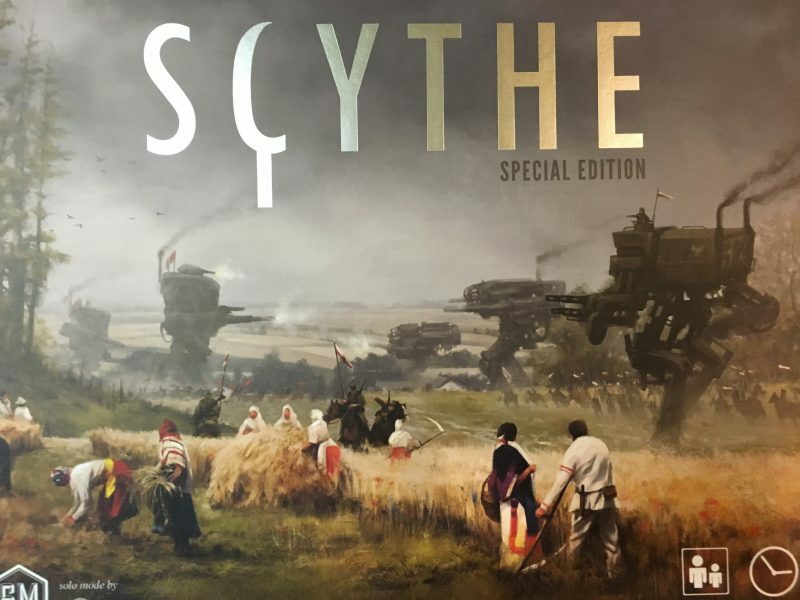 Stonemaier games recently announced an expansion to Scythe: The Wind Gambit, and I can’t remember the last time I was so excited about a board game expansion. First of all it gives everyone an airship, which is undeniably awesome. But more importantly it provides a deck of cards that supply alternative end conditions. Could this expansion patch my single biggest complaint about the game? Maybe. I hope so. I want a copy as soon as it’s released so I can try it out. I enjoy the combat in Scythe more than you do. Combat does take on a cold war posturing quality, as you say, but I think thats pretty much what the game needed. For not being the focus of the game, I think the combat is effective in making players jockey for board position. The hidden combat power cards make a difference, and its all tied to the Mech production, which has pros and cons for your economy. I’ve played games where I rush Mechs, sacrificing early economy for board access and mobility later on, and other games where I ignored Mechs almost completely, focusing on a compact econ in my corner of the board. Thematically, I think this all works really well. Mechs aren’t necessarily war machines… they can do that, but they also serve as the industrial presence in the agricultural Bolshevik countryside. Even with the event cards, the threat of Mech violence is always there, but its usually most profitable to go about your business.